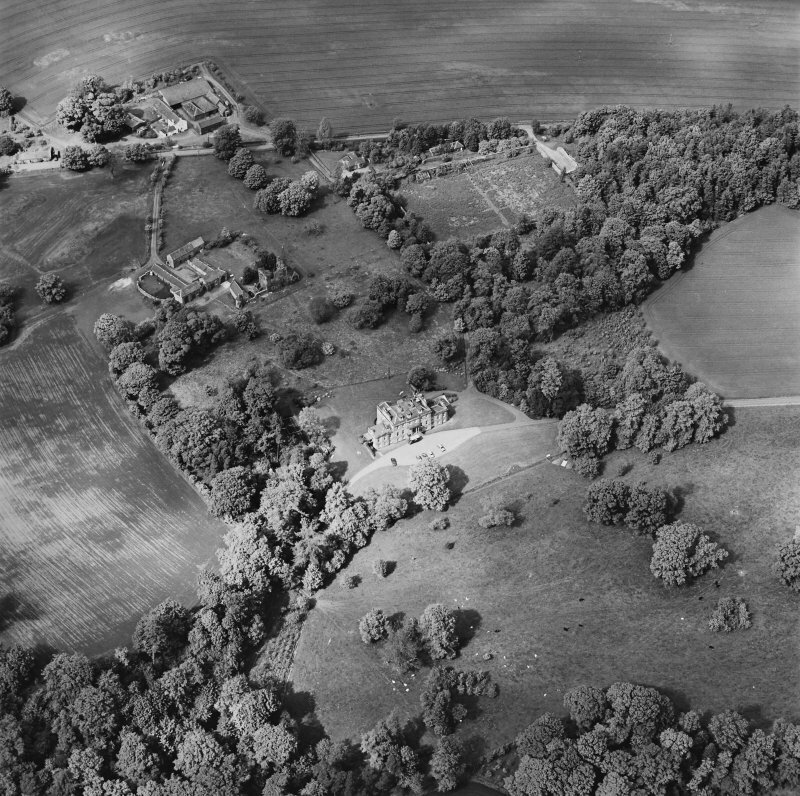 Oblique aerial view of Mountquhanie House centred on the country house, 'dovecot', stables and the remains of a castle, taken from the NNW. 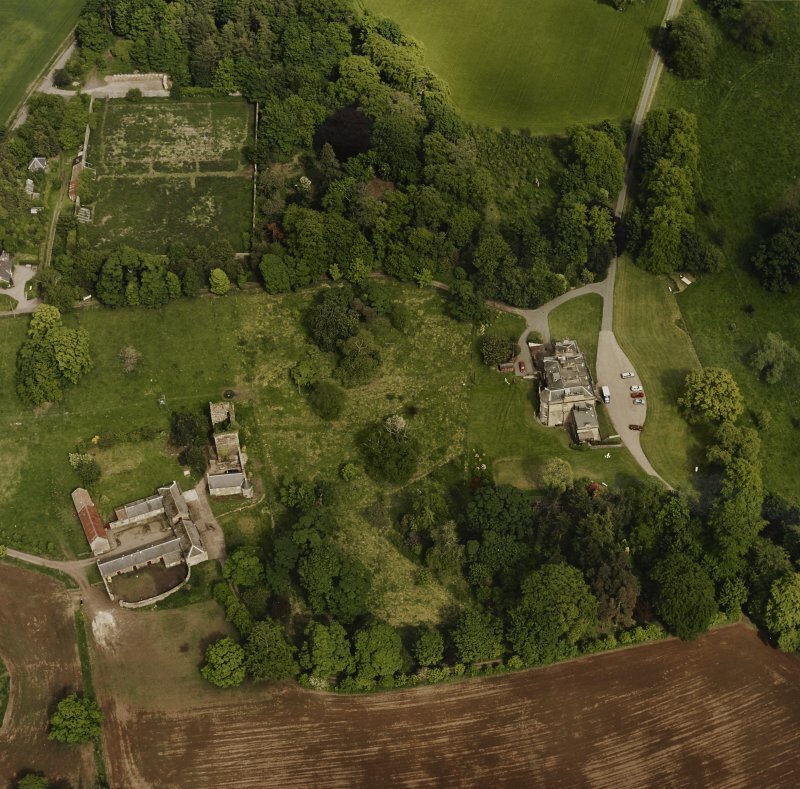 Oblique aerial view of Mountquhanie house, centred on the country house, 'dovecot', stables, farmsteading and the remains of a castle, taken from the SSW. 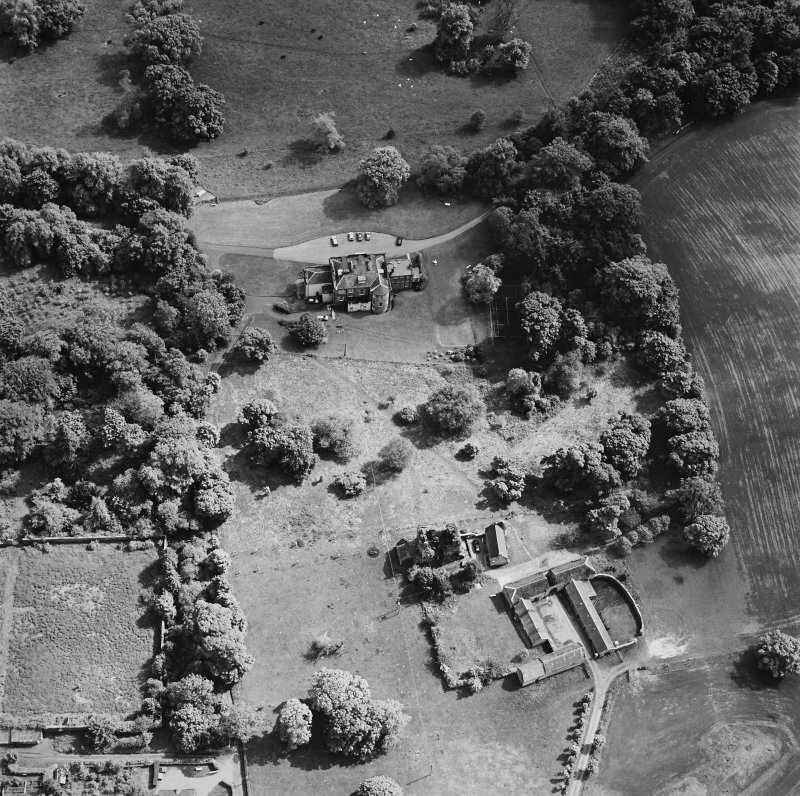 Oblique aerial view of Mountquhanie House centred on the country house, 'dovecot', stables and the remains of a castle, taken from the ENE. 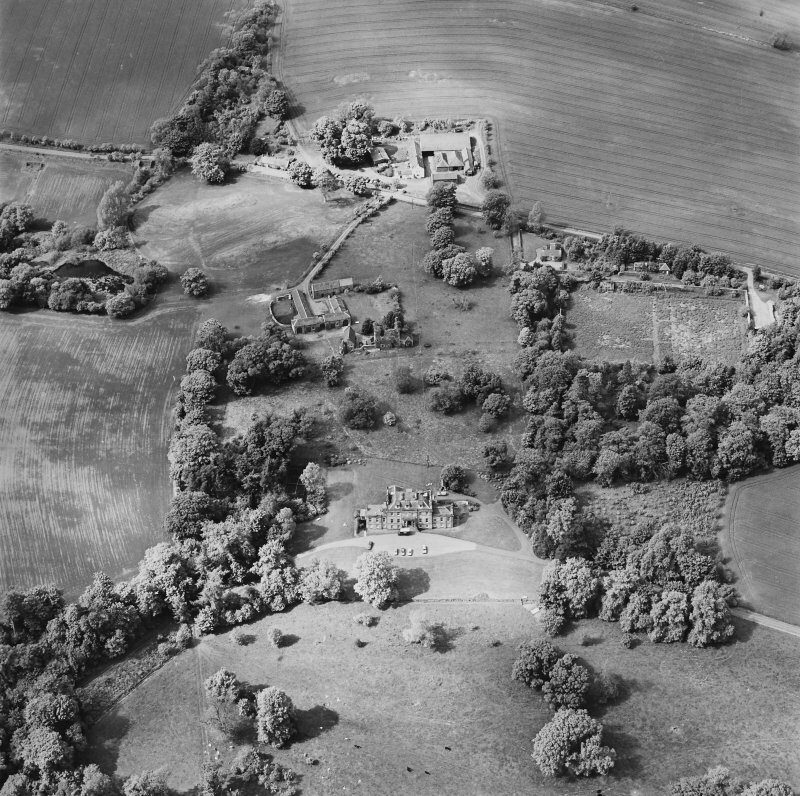 Oblique aerial view of Mountquhanie house, centred on the country house, 'dovecot', stables, farmsteading and the remains of a castle, taken from the S.
Oblique aerial view of Mountquhanie House centred on the country house, 'dovecot', stables and the remains of a castle, taken from the NW. 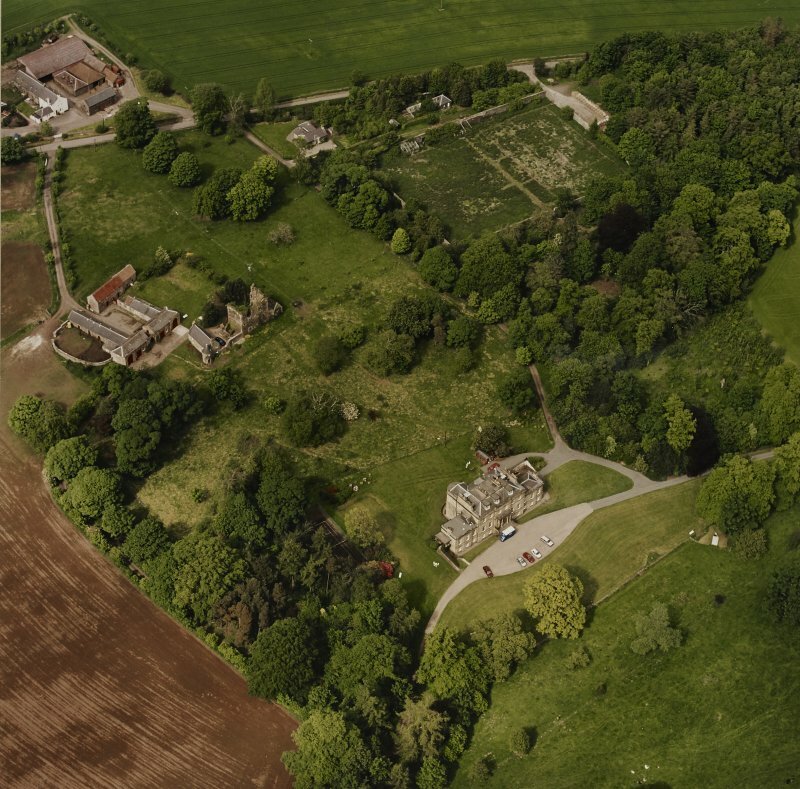 Oblique aerial view of Mountquhanie house, centred on the country house, 'dovecot', stables, farmsteading and the remains of a castle, taken from the SSE. 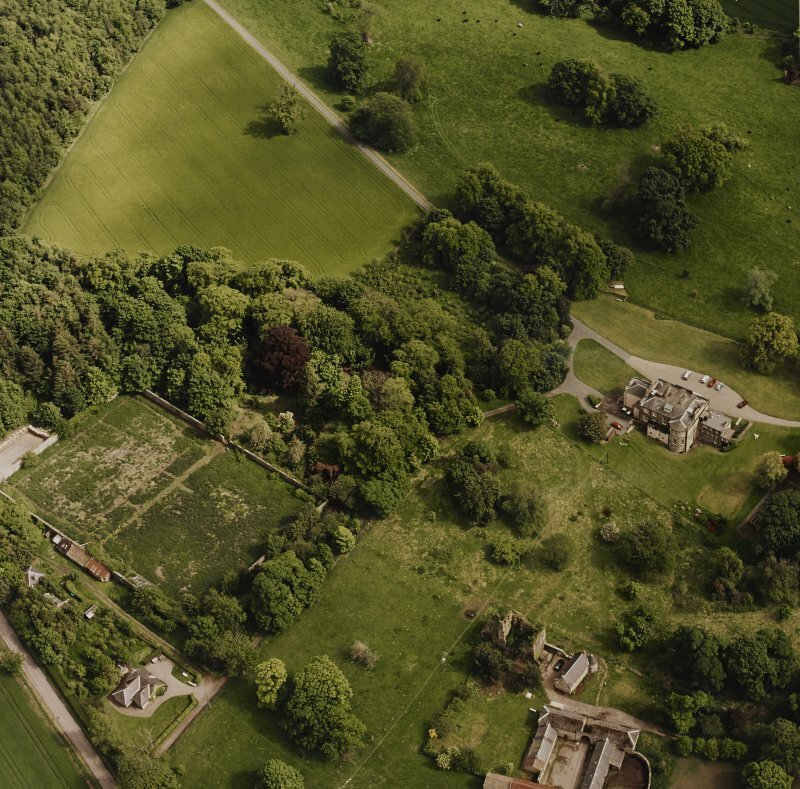 Oblique aerial view of Mountquhanie house, centred on the country house, 'dovecot', farmsteading, stables and the remains of a castle, taken from the SSE. 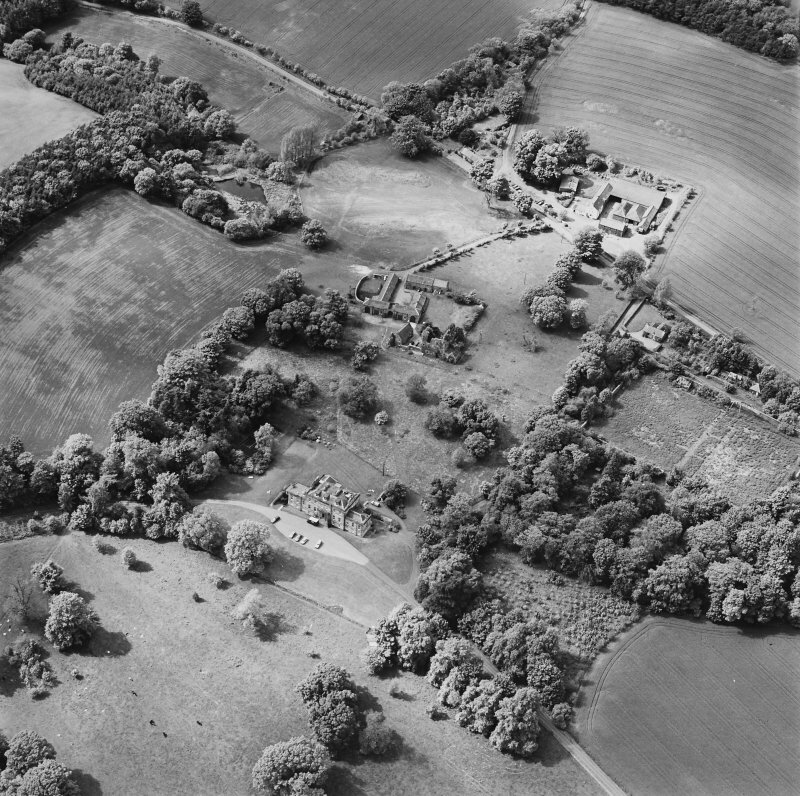 Oblique aerial view of Mountquhanie house, centred on the country house, 'dovecot', stables, farmsteading and the remains of a castle, taken from the SE. 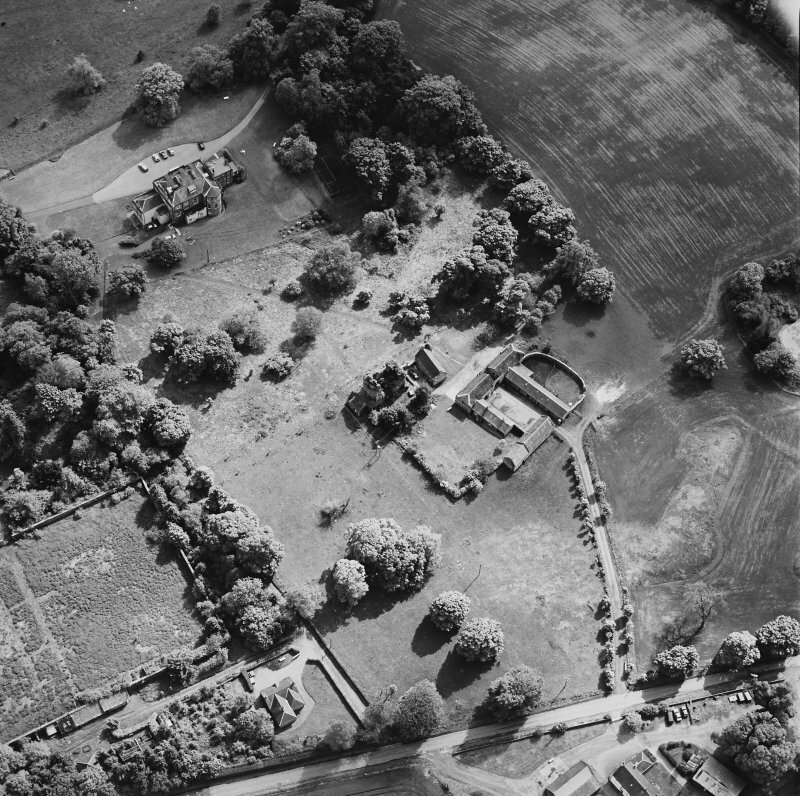 Oblique aerial view of Mountquhanie House centred on the country house, 'dovecot', stables and the remains of a castle, taken from the NNE. 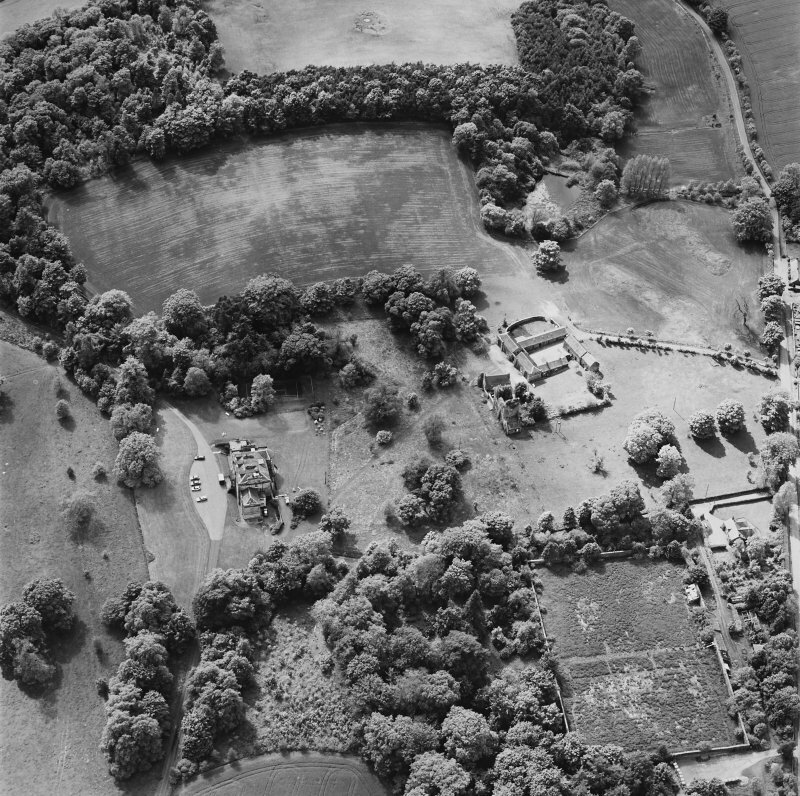 Oblique aerial view of Mountquhanie House centred on the country house, 'dovecot', stables and the remains of a castle, taken from the WSW. For Mountquhainie House and associatied sites, see NO32SW 54.00. The original building was a 16th century keep measuring externally 43 1/2' by 26', with three storeys below the wall-head. It is ruinous and covered in ivy. An outside stair, and a W range were added in the 17th century, two storeys high with a circular tower in the SW angle, which is used as a dovecot. Only the entrance of the S building remains, with a lintel inscribed '1683'. Another stone dated 1592, (not in situ) is above the backdoor of Home Farm. 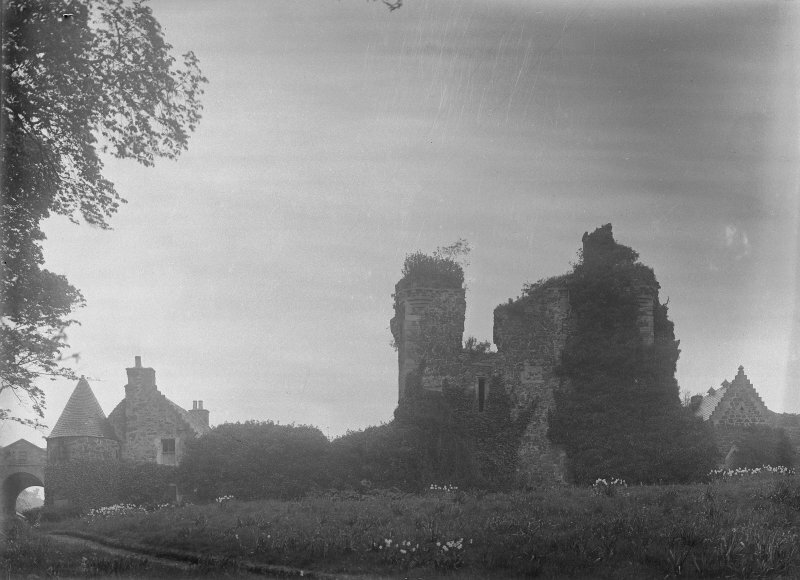 "Munquhane" is mentioned in 1459, and a charter dated 1547-8 specified the "tower, fortalice and manor-house"
Mountquhanie Castle is as described above. 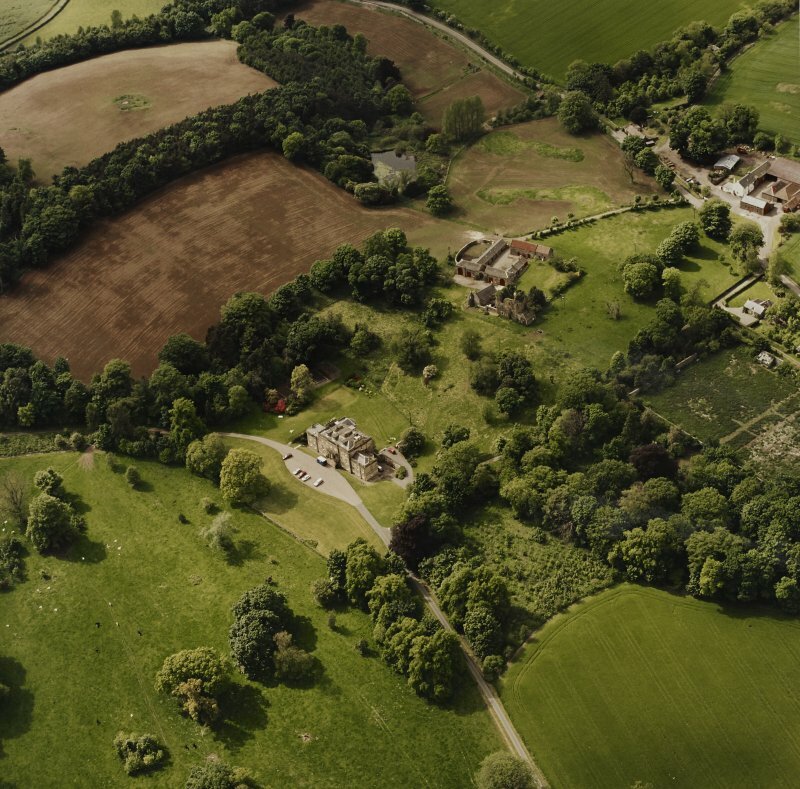 The 17th century range has been restored and is occupied by estate workers. 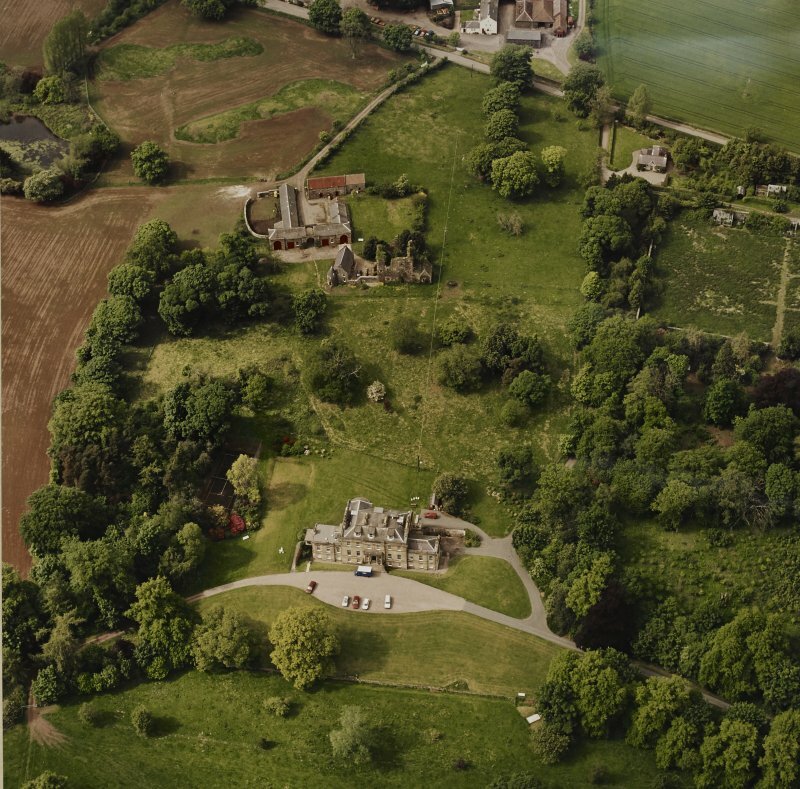 The ruin of this 16th century fortified house comprises an oblong tower-house, formerly of three storeys. There is a courtyard to the west, open to the north and walled to the south. There are two-storey buildings on the west side of the courtyard, the corner tower of which has a conical roof. The courtyard buildings are now occupied as a house known as Feather Cottage. The castle was deliberately ruined after the completion of Mountquhanie (or Mountquhannie) House in the 1830s. A small single-storey 'Gothic' laundry was constructed to the east of the tower-house. Feather Cottage was used for estate workers' housing and the upper portion of the circular tower was converted to a dovecote. The vaulted ground-floor chambers were converted to an estate slaughterhouse and butcher shop. The slaughterhouse occupied the east chamber and had a large tree trunk built into the walls to support it just under the vault. This was used to hoist the carcases during the slaughtering process. The west chamber contained the butcher shop and two of the blocked window recesses were converted to smoke kilns for the curing of meat. The cattle were driven from Balquhidder to Mountquhanie each Martinmas and a butcher was brought from Cupar to slaughter the animals and cure the meat This practice continued into the fIrst half of this century when the slaughterhouse was abandoned. There is also a small domestic icehouse a little to the west of the farm buildings. To complete the romantic image the ruin was planted with ivy. 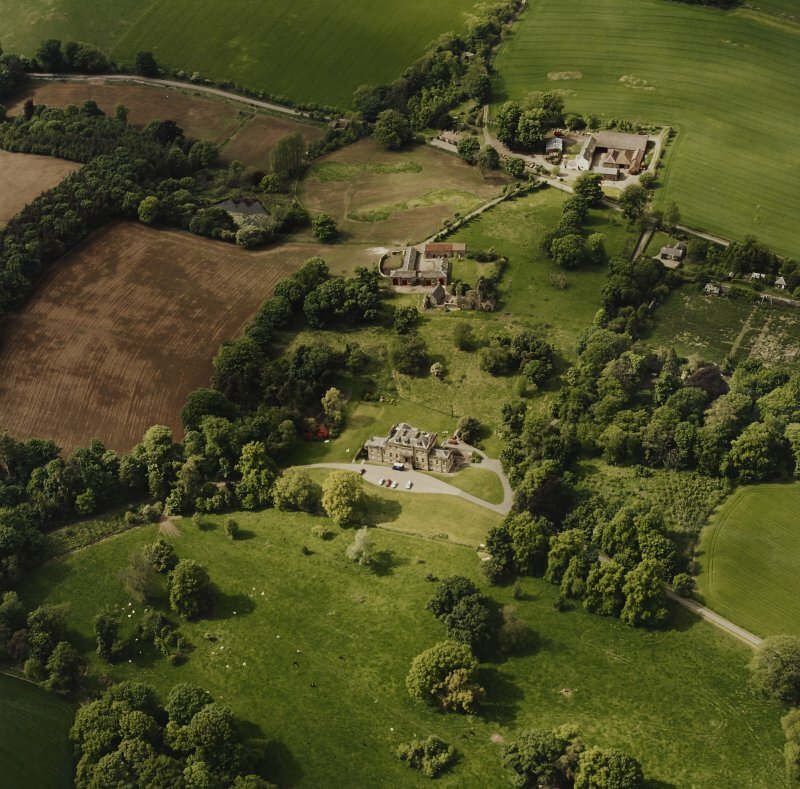 Its position on the brow of a hill helped to achieve its utilitarian function of disguising these estate buildings and screening the farmstead from the mansion house.